Daniel Dye and the Miller Road Band will bring their music to downtown Urbana at 3 p.m. July 18 during Art Affair on the Square. Part of the Champaign County Art Council’s Concerts in the Park series, the musical group will be one of several live entertainment offerings during Art Affair, which is sponsored by the Monument Square District. The performance and the entire Art Affair are free of charge. Daniel Dye was raised in Champaign County and spent a good part of the last decade writing songs as he backpacked his way around the world – living in China, Germany and Poland. According to Dye, after returning to the United States, he began playing music with the Miller siblings (who are also his nephews and niece), bringing their sensibilities as young musicians to his own tunes. Over time, sing-a-longs at family get-togethers and weekly gigs at the Mechanicsburg farmers market began growing into something far more serious. 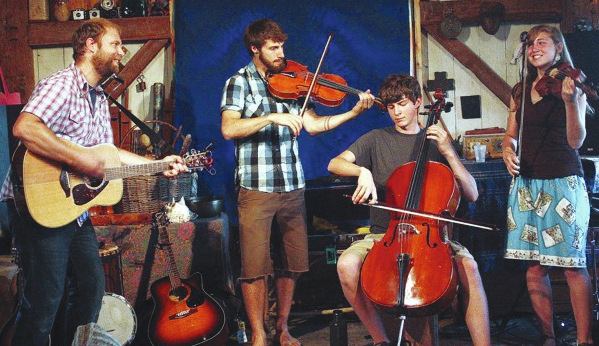 The Millers (classically trained in the cello, viola and violin) added a more sophisticated sound to Dye’s guitar and harmonica. The banjo, mandolin, accordion and cajon were soon mixed in and the Miller Road Band was officially formed. The band’s first album, “Daniel Dye featuring the Miller Road Band,” has gained momentum in central/southwest Ohio with radio airplay on NPR affiliates 91.3 WYSO (Yellow Springs) and 90.5 WCBE (Columbus). The Miller Road Band is featured on about half the 14-song album, while the other half is Dye alone with the banjo or guitar, as he also tours as a solo artist. Currently Dye is carving out a life in Springfield, and with his family has started the annual Madden Road Music Festival in Mutual. Information provided by the Champaign County Arts Council.